Fabian Quoss has done it, winning the €50,000 Single-Day Super High Roller at the 2016 PokerStars and Monte-Carlo® Casino EPT Grand Final for €849,059 following a heads-up deal with fellow German star Ole Schemion. After the event ran 17 hours on Sunday, the final two competitors halted the action at 5:30 a.m. local time with plans to finish it out another day. 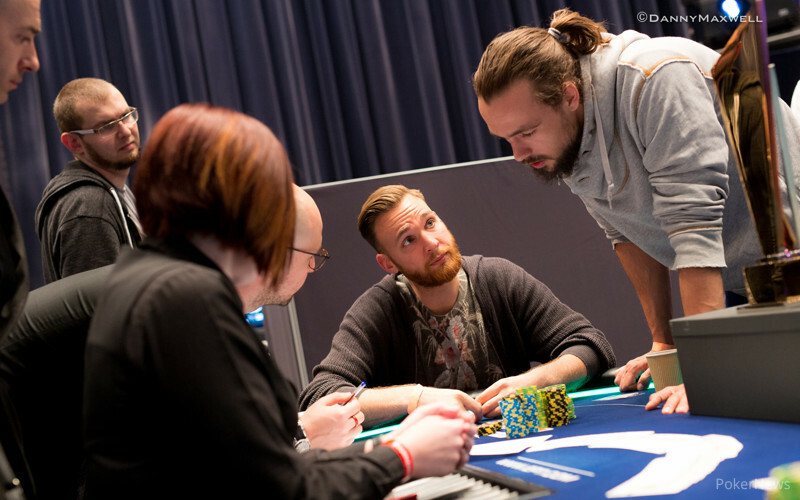 Both were alive in the €5,300 Main Event, but busted well before the end of the day on Monday in that one, allowing them to finish play in this big buy-in affair. The two couldn't come to an agreement on a deal on Sunday night, but they were able to shake hands on a chop before resuming the action on Monday. 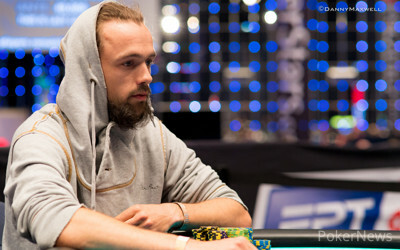 Schemion had the lead coming into heads-up play with 8.77 million to Quoss' 5.23 million, and he would take €857,241. Quoss took €799,059, and the duo agreed to leave €50,000 on the table to play for. The action started slow with limped pots and a few all-in shoves by Quoss, but it was one of those shoves that wound up turning things around in the match. Quoss limped in from the button for 300,000, and Schemion asked for a count. Quoss counted out his stack of 3.56 million, and Schemion pushed all in. Quoss quickly called with the , and Schemion had the . The flop came , followed by the on the turn and the on the river, and Quoss had doubled. Schemion then open-shoved his last 4.8 million to the middle from the button. Quoss glanced at his cards, and was as sure as he could be he wanted to call. Schemion knew he was behind right away. The flop came , just about sealing it for Quoss. The on the turn did just that and the two German high rollers shook hands and hugged, as the dealer burned and put the on the river to officially finish things off. All told, the heads-up match lasted just about 25 minutes. Although finishing runner-up, Ole Schemion actually won more than Quoss due to the deal, but Quoss was the player walking away with the official title. 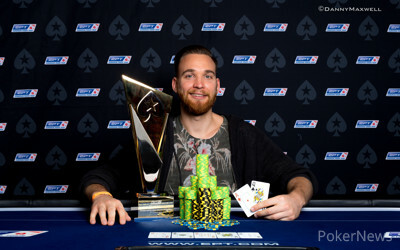 Some might think it seems only fair that Quoss got to hoist this trophy as Schemion won the €100,000 Super High Roller for a whopping €1,597,800 two days ago at the EPT Grand Final. Thanks to those two scores, he's now very much in the lead on the German all-time money list. On that same list, Quoss jumped from fifth to fourth with his score. Also of note in this event was that Steve O'Dwyer overtook Mike McDonald in the EPT Season 12 Player of the Year race thanks to his ninth-place finish in the money. With a handful of events left, McDonald will now have to play catch up to O'Dwyer, but it's still very much anyone's title to win. That wraps up PokerNews' coverage of this event, but there's still plenty more to be had from Monaco with the €5,300 Main Event continuing on and the €25,750 High Roller starting on May 4. Check out the PokerNews Live Reporting section for more. Ole Schemion on the button open shoved his last 4.8 million to the middle from the button. Fabian Quoss glanced at his cards, and was as sure as he could be he wanted to call. Schemion knew he was behind right away. The flop came , just about sealing it for Quoss. The on the turn did just that and the two German high rollers shook hands and hugged, while the dealer burned and put the on the river. While finishing runner up, Ole Schemion wins more money for his second place (€857,241) than champion Fabian Quoss (€849,059). Ole Schemion limped in and the flop came . Fabian Quoss bet 400,000 and Schemion then raised to 1,175,000. Quoss called before both checked down the turn and the to see Schemion turn over for a bluff. Quoss flipped over and that won the pot. Fabian Quoss limped in from the button for 300,000, and Ole Schemion asked for a count. Quoss counted out his stack (3,560,000) and Schemion pushed all in. Quoss called instantly. The flop came , pairing Quoss. The on the turn left Schemion some outs, but despite pairing him, the on the river wasn't one of the cards he needed to hit. Quoss doubled into the lead. In the second hand after restart, Ole Schemion limped in and Fabian Quoss stared back before announcing his all in. Schemion quickly folded. The next hand saw a walk for Schemion in the big blind before he limped in and then folded to another shove of Quoss. Another walk was followed by Schemion's third limp in a row and this time Quoss checked his option in the big blind. On the flop, both players checked and Quoss then min-bet the turn for 300,000. Schemion called to see the river, where Quoss won the pot without showdown by betting 500,000. Fabian Quoss started on the button and raised to 600,000. Ole Schemion carefully cut out 1,550,000 and pushed his three bet forward. Quote thought about it for a bit before calling. The flop came and Schemion bet 525,000. Quoss folded after about a minute in the tank. The heads up hasn't restarted again, so you didn't miss out on any action just yet. Fabian Quoss and Ole Schemion both showed up on time and then discussed deal numbers. They agreed on an ICM deal and will leave another €50,000 to be awarded to the eventual winner. Below are what both of German High Roller regulars have locked up. The Quoss vs. Schemion Match Resumes at 9!